I cut my base card using the cricut and scal software,added some acetate for the globe, my designer papers are from Bearlymine Designs Christmas Wishes collection, My Digi image is by Phooka a sweet little snowman coloured with promarkers,added some snowflakes to the frame and acetate and 2 large snowflakes cut on the cricut. Terrific shaped card. Thanks for playing at Ellephantastic this month. What a really cute card. I love the snow man. oh my goodness, this is precious! I love the shape and design! 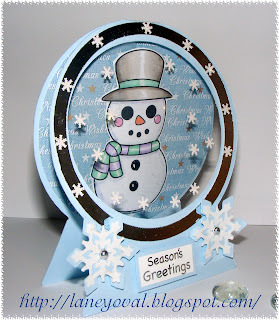 LOVE your snow globe card!! What a very creative idea. Thanks for joining the Anything Christmas Challenge at Top Tip Tuesday. Thanks so much for joining in with our digi image challenge at Paper Sundaes. What a great idea. I love this snow globe and that snowman is just super cute. Hi Laney love it! gorgeous!